The foundations for Ann’s business career were laid when she joined Twentieth Century Fox Film Studios in London, as a secretary, at the age of sixteen, having finished her GCE and RSA exams. Her mentors continually challenged her to strive for excellence whilst developing a strong work ethic. She realised the power of teamwork, the importance of loving what you do and that communication and networking are vital in business. Highlights of her years in the film industry were meeting the Beatles and Sean Connery and driving in 007’s Aston Martin! Ann’s keen sense of adventure led her to immigrate to sunny South Africa, gaining valuable experience as a consultant in the manufacturing, insurance and recruitment sectors. 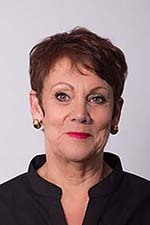 As the personnel consultancy established by Ann and a partner grew, so the need for computer skills became apparent and, in 1988, Ann established options in training. options in training has gone from strength to strength. In addition to raising four children and building her own home, Ann considers her company to be her crowning achievement. 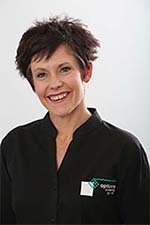 With a Packaging Management Diploma and over 20 years computer and business skills training experience, during which she has become a Microsoft Office Specialist Master Instructor, MCT (Microsoft Certified Trainer), with IC3 and ICDL together with being a registered Assessor and Moderator – Chantal is well-qualified in her capacity as Training Manager. She has a reputation amongst corporate companies for unending patience and an astute awareness of individual needs, assisting to top management level. Coupled with a quick wit and sense of fun, her depth of knowledge to an advanced level of a large number of end-user packages has proved invaluable, not only when training clients or her own staff and but also in support, consulting, research and development of course material. The Train-the-Trainer course which she researched and developed has the approval of Microsoft as part of their internationally recognised Microsoft Certified Trainer qualification. She has extensive broad-based computer knowledge on the various versions of Windows and Microsoft Office up to 2016, and even, in the distant past now, Lotus SmartSuite and Perfect Office – and space to hang her qualification certificates (especially in Microsoft applications) is becoming very scarce! Michélle moved into the corporate business skills training world after 16 years in the South African public education system with her sense of humour intact, a huge supply of patience, and the awareness that no-one can ever know it all! She says that her desire to empower people is the natural result of being the eldest child. She gave horse riding lessons to make pocket money whilst at high school, and was the first person in her family to earn a degree. With these words of Maya Angelou as her mantra, Michélle embarked on her training career at options in training 11 years ago. She has developed learning programmes for over 10 new Business Skills courses, designed according to market/company needs and NQF Unit standards, as well as customised training for specific organisations. She currently facilitates Business Skills courses on communication, emotional & social intelligence, empowerment and public speaking. Michélle also trains Microsoft Office Word, PowerPoint and Outlook to an advanced level. In addition to her BA (Ed) degree she is an accredited Assessor and Moderator. She is extremely proud of the company’s first group of unemployed learners who graduated with End User Computing national certificates after their year-long learnership. 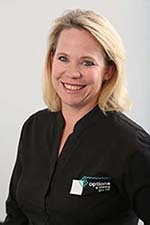 Kerry Audouin has been an intrinsic part of the options team for 6 years. Although her formal job title is Receptionist/PA to the Managing Director, she has displayed the ability to turn to her hand to almost any task which has come her way. This is no doubt due to her having worked in a number of different fields. Kerry studied Jewellery manufacturing and design at WITS Technicon and Garden landscaping through Lifestyle Garden College. Kerry ensures that our training delegates find their way to our premises from all over the province and beyond, and welcomes each one when they arrive. She also oversees the garden, our organic vegetable patch and may be seen fixing various things with a screwdriver in hand. 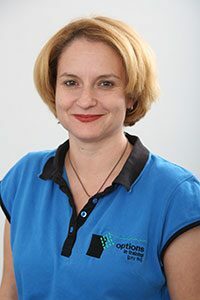 She loves working and adding value to the team at options, and strives to bring as much creativity and attention to detail to her work as she can, in order to get things done. Her hobbies include painting African scenery and creating stained glass objects, and she loves watching movies and reading. Pumla Ntuta came to options in training as a delegate several years ago and has recently joined the team! She stepped into the shoes of Poppy Qampi, who retired after 30 years of service, and is filling them with flair and enthusiasm. Pumla thoroughly enjoys meeting and interacting with lots of different people, which is why she has already proved to be an asset in our corporate training environment. 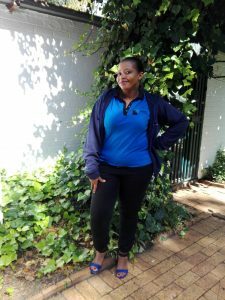 After matriculating from Boksburg College, Pumla enrolled in a number of tertiary training courses and learnerships, all involving customer service. She honed her Reception & Telephone Skills at options in training and well as completing a Call Centre Agent Learnership and earning her National Certificate in Compact Centre Support Level 2. Pumla has worked as a telesales consultant and data capturer in several organisations and enjoyed the sharing of ideas and skills. Her previous position as Sales & Merchandising consultant at Foshini TFG developed her ability to engage with different people, challenge ideas and take pride on her work. Since her arrival Pumla has included vegan, vegetarian and Banting recipes into our menu and has slotted easily into our team with her pro-active attitude and excellent people handling skills.